Donald Trump promised he would reopen the coal mines. Is it a promise he can keep? Photo by Steve Helber, courtesy of AP Images. 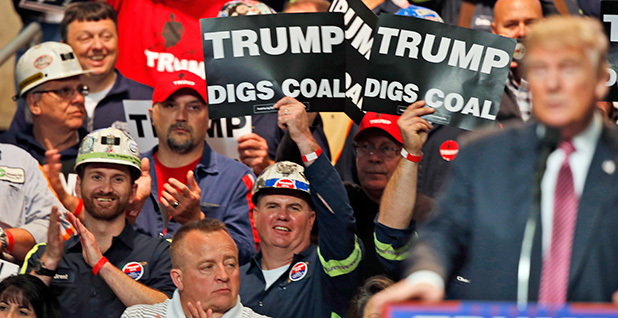 Donald Trump's promise to open shuttered coal mines in Appalachia might be as hard to fulfill as getting Mexico to pay for a new wall, analysts suggested. The vow by the presumptive Republican presidential nominee would likely mean turning back regulations on greenhouse gases and perhaps toxic air pollutants, experts said. Even then, it's unlikely that the cost of extracting coal from eastern mines would be cheaper than using natural gas in power plants, they said, making a widespread mining revival improbable. "It's very, very, very unlikely he could do something to get coal back to where it was seven years ago," said John Deskins, director of the Bureau of Business and Economic Research at West Virginia University. On Thursday, Trump drew wild applause in Charleston, W.Va., by telling miners in hard hats and reflective stripes to get ready to be "working your asses off" in reopened mines if he's elected. Some people waved signs saying, "Trump digs coal," and the business tycoon joked about needing a spritz of hair spray after trying on a miner's helmet, the gift of an industry group. "I'm thinking about the miners all over this country," Trump said. "We're gonna put the miners back to work. We're gonna put the miners back to work. We're gonna get those mines open." His comments were directed at a plunging industry. Eastern coal is facing rising extraction costs because its veins are thinner and buried deeper than the coal in Wyoming's sprawling Powder River Basin. Eastern coal can cost up to twice as much as the western resource, making it unable to compete against cheaper natural gas, experts said. West Virginia is especially suffering. Its production peaked in 2008 at 158 million short tons. It's been tumbling ever since as hydraulic fracturing and horizontal drilling have supplied greater amounts of natural gas. This year, the state is expected to extract between 80 million and 90 million short tons, Deskins said. "Coal keeps producing worse than we expect," he said. Chiza Vitta, an analyst with the credit rating service Standard & Poor's, sees two ways that Trump might try to fulfill his promise to reopen the mines. The first is a protracted effort to turn back a number of environmental regulations, like the pending Clean Power Plan curbing greenhouse gases from power plants. "That seems to me a very, very low probability," Vitta said. "We by no means are saying it's going away completely," Vitta said. "There's always going to be a space for thermal coal. But the industry is going to be notably smaller to be profitable again." He added, "We do not view regulations as the primary factor for the decline." Trump's comments opened a new attack against Hillary Clinton as the former secretary of State plods toward capturing the Democratic nomination. She faces the prospects of losing the West Virginia primary election today following a turbulent swing last week through the coal states of Kentucky, West Virginia and Ohio. Sen. Bernie Sanders (I-Vt.) is leading Clinton in the polls entering today's vote, and he could sustain his campaign with a victory. He focused on addressing poverty over climate change in a visit to McDowell County, W.Va., late last week. The area has one of the lowest male life expectancies in the nation. But it's Trump who holds West Virginia in his hands. The state hasn't voted for a Democratic presidential candidate since President Bill Clinton nabbed 52 percent in 1992. In the last election, President Obama, seen as a divisive figure there in part because of his climate policies, managed to get just 36 percent of the vote. Trump jabbed at environmental rules in his visit last week, but he didn't mention climate change or promise to roll back the Clean Power Plan. "Give me a mirror," Trump joked after trying on the hard hat. "But no, in the old days you put the hair spray on and it was good. Today, you put the hair spray on and it's good for 12 minutes, right? I said, 'Wait a minute, if I take hair spray and I spray it in my apartment, which is all sealed, you're telling me that affects the ozone layer? Yes.' I say no way, folks, no way. That's like a lot of the rules and regulations you people have in the mines. It's the same kind of stuff." One Republican adviser said it was conspicuous that Trump didn't turn his sights on the Obama administration's climate policies. The timing and the location were ripe for a line of attack on regulations that Clinton has promised to usher toward completion, said the adviser, who suspects that the campaign is trying to limit Trump's release of detailed declarations until it staffs up for the general election and is better able to steer his policy positions. "For him not to talk about climate and EPA ... it seems like that would have been a conscious decision until he figures out his policy positions," the adviser said. Paul Bledsoe, a climate aide in the Clinton White House, believes it was a "wily" move by Trump to avoid taking a firm position on the Clean Power Plan. It prevents giving Clinton new material to use for Democratic turnout and fundraising, for now. "Because he doesn't have an answer, right? I'm sure he hasn't thought about, 'Well, what could reasonably replace the Clean Power Plan?'" Bledsoe said. Others see it as a symbol of Trump's underestimated brilliance. He didn't talk about killing regulations because it doesn't work as well as just jumping to the part about opening mines, said Mike McKenna, a GOP energy lobbyist. In his mind, it's skipping the middleman. "He's drawing a pretty clear comparison between his opponent [Clinton] and himself," McKenna said. "Her general message to coal country is, 'Go eff yourself.' His message is, 'I'm at least gonna try.' My big takeaway from the speech was, is it an over-promise? Yeah, maybe. But the message is spot on: 'I'm gonna try.'" To another Republican energy adviser, vowing to oversee a coal resurgence is in line with Trump's other themes. Nothing is too big to achieve. "There's probably a higher likelihood of reopening a coal mine under a Trump presidency than there is of getting Mexico to pay for a wall," said the adviser, who worked under President George W. Bush. "So I don't see this as like sort of another outlandish category of comments from him."